Electrotherapy uses a variety of methods, primarily ultrasound, laser and electrical signal (Interferential) systems as part of a comprehensive physiotherapy programme. Ultrasound works through high frequency sound waves which deliver energy to cells to improve tissue regeneration. Laser treatment involves focusing high energy light onto the target tissue areas, reducing inflammation and stimulating tissue repair. Interferential treatment involves applying a current to stimulate nerves and trigger the body’s natural pain relief mechanisms. 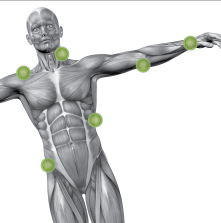 This system penetrates deeply providing pain relief and stimulating muscular repair. Our therapists are fully experienced in the use of electrotherapy techniques and are able to provide the most comprehensive physiotherapy programme tailored to ensure the most effective treatment for your specific problem area.